I believe we may have completed the 1st wave for the current retracement from bottom of 1,590. Currently, we are seeing Wave 2 developing. Where the 5min chart shows Wave 2(a) & 2(b) might also have completed this morning. 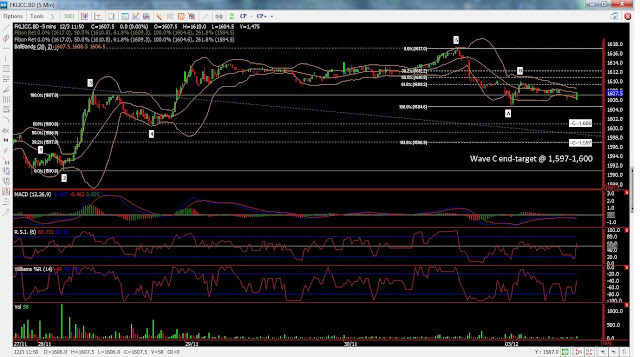 Measured move of Wave 2(a) shows potential Wave 2(c) end target at 1,597-1,600. Those holding LONG might consider taking profit first, & re-enter LONG at Wave (c) bottom. LONG from <1,600 might hold, consider adding to LONG at Wave (c) bottom. Sideliners who missed the retracement, this is the beautiful level to enter LONG, as the retracement is confirmed, & we can get to harvest the longer Wave 3, riding through the statistically bullish December month. Any LONG for this month shall take note not to hold into the last week, unless there's significant progress on the budget talk in US to avoid falling over the Fiscal Cliff.